ADELAIDE, South Australia, 18 September 2018 – SolarReserve, a leading worldwide developer of large-scale solar power projects and advanced solar thermal technology, announced it has signed a Memorandum of Understanding (MOU) with Heliostat SA, a South Australian company focused on the manufacture and assembly of heliostats and heliostat components. Under the MOU, Heliostat SA and SolarReserve will partner in the development of plans and processes for the supply, fabrication and assembly of more than 12,800 of SolarReserve’s proprietary SR96 heliostat assemblies for the Aurora Solar Energy Project near Port Augusta, South Australia. Heliostats are the large tracking mirrors in a solar thermal power station, which follow the sun throughout the day and precisely reflect and concentrate sunlight onto a receiver. 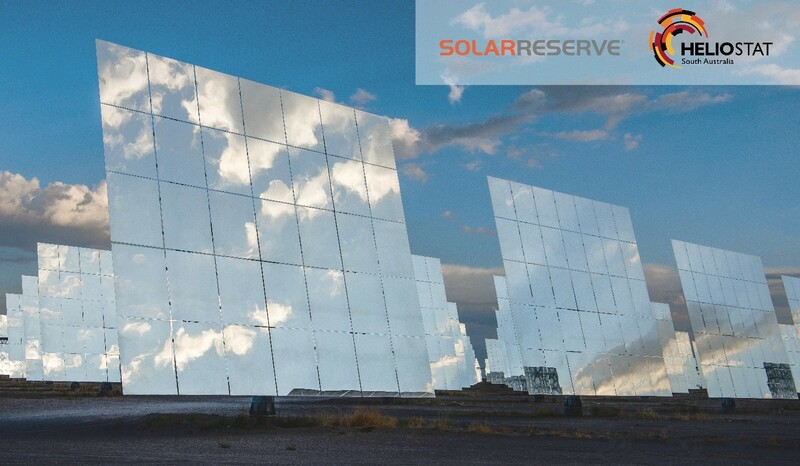 [How it works] The SR96 heliostat will provide market leading performance, fully integrated with SolarReserve’s proprietary molten salt receiver and controls system. Each of the assemblies includes 96 square metres of glass, plus steel supports and electric drives, resulting in a field of mirrors with more than a million square metres of surface area. Close to 200 jobs could be created in South Australia solely as a result of a deal between Heliostat SA and SolarReserve for the Aurora project, including over 115 unique skilled labor positions related to manufacturing of steel components and heliostat assemblies. The two companies are working together to complete the final agreement, which includes achieving as much local content and labour as possible. The balance of construction of SolarReserve’s Aurora project in Port August is anticipated to create an additional 650 full-time construction jobs on site, and more than 4,000 direct, indirect and induced jobs in the region. The Aurora project is being developed with the option to add solar photovoltaic (PV) technology in order to maximise electricity generation from the CSP facility during peak demand periods, as well as meet the station’s own electricity needs. The addition of PV could broaden the scope of Heliostat SA’s manufacturing supply to include PV racking systems. “The Aurora project along with SolarReserve’s future investment in the state will develop a supply chain and local manufacturing expertise that can be leveraged across the broader region, create thousands of jobs for South Australians, and bring about a new age in clean, reliable and affordable energy,” said Tom Georgis, SolarReserve’s Senior Vice President of Development. Heliostat SA is a South Australian company and part of the Fusion Renewables Group which comprises Precision Components, Fusion Capital, and the University of South Australia. Precision Components is a founder shareholder of Heliostat SA, having historically been a tier one supplier to Ford, Toyota and GM Holden. After auto producers announced their decision to cease manufacturing cars in Australia, Heliostat SA was borne out of Precision’s strategic plan to transition from a component hot stamping and metal pressing business to an advanced manufacturing and engineering business with a focus on high value-add, specialized products in emerging markets leveraging collaborative partnerships with like-minded companies and universities. Fusion Capital is the investment arm of Precision Components and looks at investments into advanced manufacturing and engineering opportunities, which have synergies with their existing portfolio of projects and include mass transport solutions and renewables. SolarReserve is a leading global developer, owner and operator of utility-scale solar power projects, with more than $1.8 billion of projects in operation worldwide. The company has commercialised its proprietary ThermaVault™ advanced solar thermal technology with integrated molten salt energy storage that delivers renewable power that is dispatchable 24-hours per day. The U.S. developed technology is now one of the world’s leading energy storage technologies and allows solar energy to operate like traditional fossil-fired and nuclear electricity generation – except the fuel is the sun which means zero emissions, zero hazardous waste, and zero dependence on fuel price volatility. SolarReserve is also experienced in advanced heliostat and collector field design, deployment and controls. The company’s heliostat innovation areas include advancements in pointing accuracy, nimble structure design, high precision and efficient drive systems, ultra-light and high reflectivity mirror facets, and various heliostats and collector field control, power and communication systems. Since the company’s formation in early 2008, SolarReserve’s experienced team has assembled a pipeline of over 13 gigawatts across the world’s most attractive, high growth renewable energy markets. SolarReserve is headquartered in the US and maintains a global presence with six international offices to support widespread project development activities across more than 20 countries. The company has been developing projects in Australia since 2013, with its Australian headquarters located in Adelaide, and field office located in Port Augusta. Visit www.solarreserve.com for more information about SolarReserve. Heliostat SA is a leading solar manufacturing and professional services company spun off from the automotive components manufacturer Precision Components Australia, prior to the windup of car manufacturing in Australia. Heliostat SA licenced the technology to commercialise and manufacture the CSIRO designed heliostat and control software in 2014. It has installed fields in Japan, and more recently built an R&D field with twenty five (25) heliostats located at Edinburgh Parks, South Australia. The company continues to pursue Concentrated Solar Thermal (CST) applications for high temperature industrial processes to offset high gas usage to create steam for numerous industry sectors. Key target markets include ore, chemical and food processing sectors. Heliostat SA has developed an all Australian designed and manufactured Single Axis Tracking (SAT), Fixed and Ballast framing systems for large scale Photovoltaic (PV) solar farms. The design and manufactured framing systems utilise automation processes, low cost manufacturing techniques that have been successfully developed for the automotive sector. Visit www.heliostat.com.au for more information about Heliostat SA.